Turn down the volume, without trashing the sound quality. 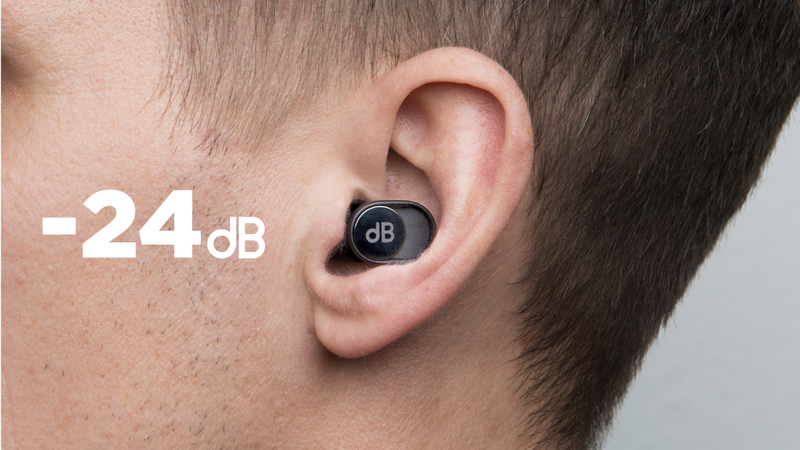 dBud's closed setting lets you enjoy the sound at the concert. And the open setting lets you clearly hear the person you are talking to above the background buzz in a noisy work-space. With the built-in magnets and the attachable leash, you can wear them around your neck, always in reach. Or you can keep them in the soft, pocket-sized case. dBud contains only mechanical tech. No batteries, no charging. Always on. Being a musician dBuds saves my day (and my ears) everyday. The Royal Albert Hall isn’t your average venue, my work there exposes me to every kind of volume and it can change every second depending on where I am, so having earplugs I can turn up or down depending on my location is invaluable, super comfy, easy to adjust and all done in a second, best sound protection devices I’ve ever used. So simple in design and so effective at providing just the right amount of reduction for the circumstance whether it’s a heavy metal rock concert, a sold out baseball game or a rowdy train ride with screaming babies and teens! And I absolutely love the cord to keep them secure! Last year I was searching for earplugs that were going to work better than the foam “throw-away” sets you get everywhere, mostly for free. I am a musician and sound engineer and needed something that was going to reduce the volume of the sound but did not reduce some of the frequencies more than others. Usually the high frequencies get cut and everything is bass dominant. Then I read about dBud and decided to become a backer and support dBud financially and hope the company would come up with the goods they were promising. As a dBud backer, I then received my first set of dBuds after the manufacturing was finally completed. I proudly checked them out at home using the stereo and I was amazed at the sound quality and reduction of volume. I could hear everything, except it was just quieter. Then the big test, to see if my new dBuds would react the same at a concert. My wife and I had bought tickets to one of our legends, Robert Plant and the Sensational Space Shifters at the Sydney Opera House (Australia) earlier this year. The concert was amazing, the sound mixing was great, the volume was not blastingly load, which I was thankful for, however, the dBuds were fantastic. I could here everything, especially the vocals, which usually drop out with general use earplugs. 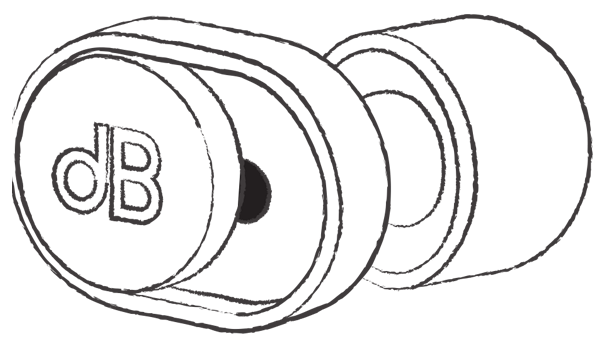 The 15db – 30db slider was amazing. The 30db setting dropped the volume even further with no frequency drop out. 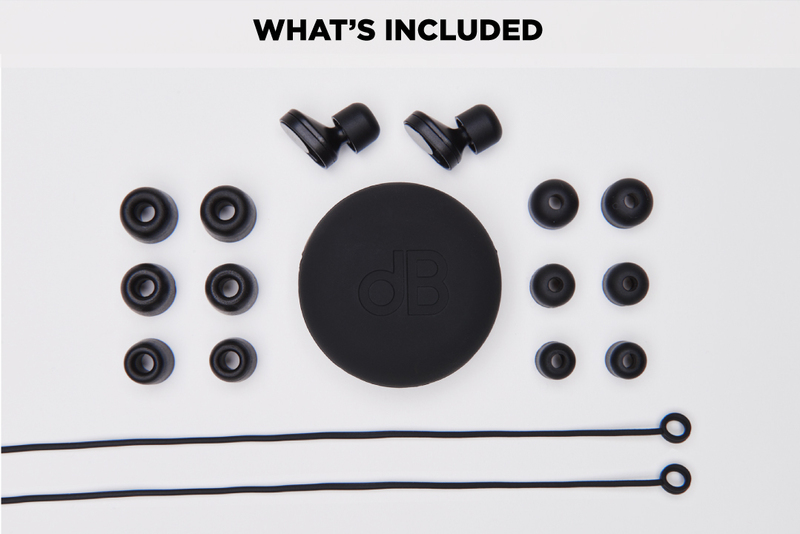 As someone who works with sound, mixing bands and going out to see bands play live, the dBuds are the best thing I have invested in for the protection of my ears with the clarity of sound maintained. One more thing I noticed was, that conversations at a concert or a pub gig were easier. You still had to get close to talk to each other, but didn’t have to shout or scream just to hear one another. 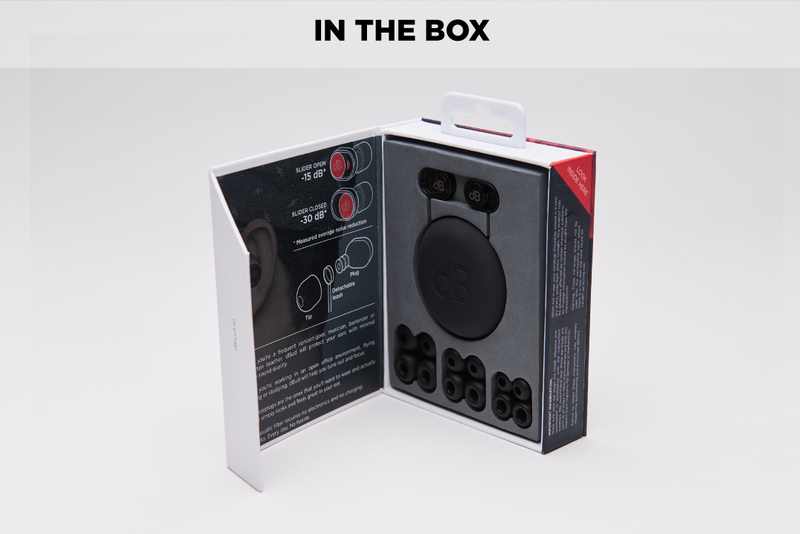 dBuds look great, fit great, they are comfortable, they don’t stick out or make you look like a goon, and best of all, they do what they say they will do. Protect your ears and maintain quality of sound. Fantastic, I love’m. 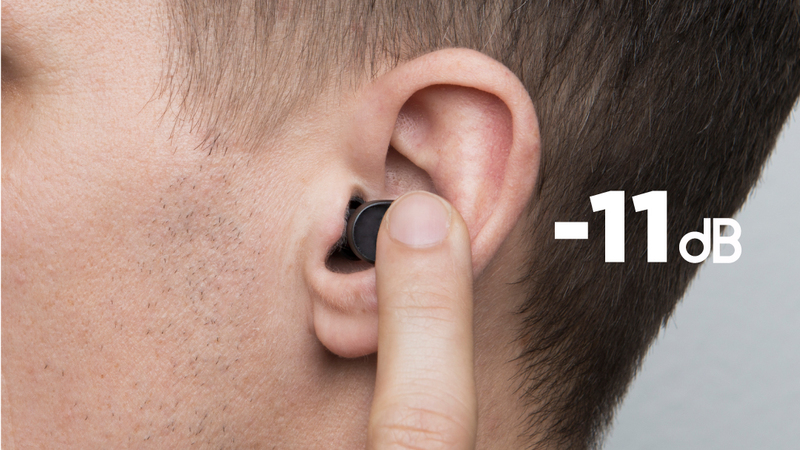 Without a shadow of a doubt THE best earplugs I have ever used. As a music photographer, I can go from a small intimate venue to a large festival photo pit and just slide to adjust the volume perfectly. Oh and of course they never get lost as they are always around my neck ready to go.. what? really? you have not bought yours yet? .. Damn, these are so cheap, yet much better than a lot of options on the market. I use them for my event-technician job. Wich means building a stage, setting up lights and speakers, make sure everything work, do the event/concert, and take everything down again.. But while working, they are easy to take out, hangs lovely with the magnets. And are very useful as you are able to talk with the -15db, but you can quickly go to -30db when you are done talking. I’ve played in a band for a couple of years now. By the end of rehearsals and gigs I found I could only hear certain frequencies and my guitar didn’t sound as good as when we started… so my ears definitely needed protection. 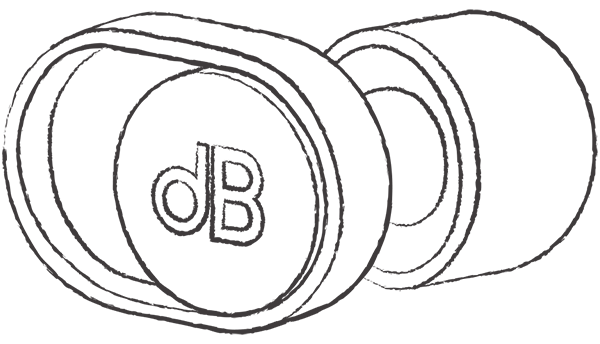 I immediately found that dBuds reduce the volume, without compromising the quality of what I hear… all the frequencies get through. 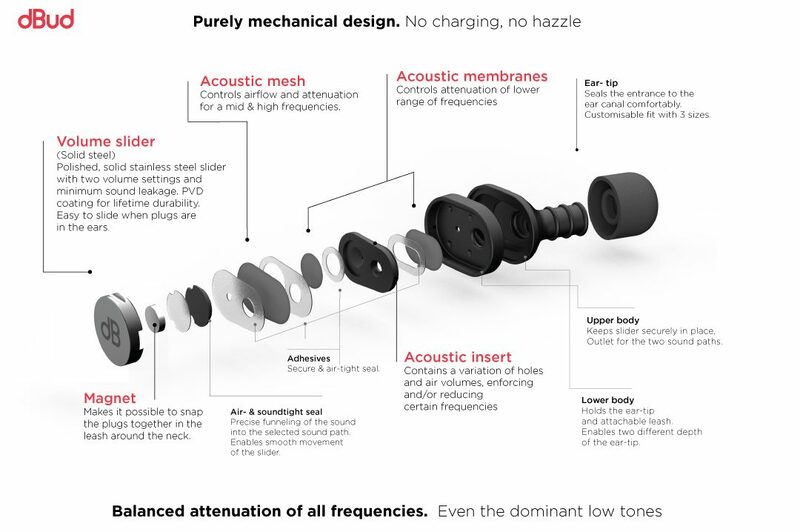 Choose the most comfortable and best fitting earbuds from the 3 sizes provided… choose foam or silicone for comfort and adjust the slider to match your needs. Great quality, great price. I now want a spare pair… my friends and bandmates want a pair. I use dBuds when I visit icehockey matches. 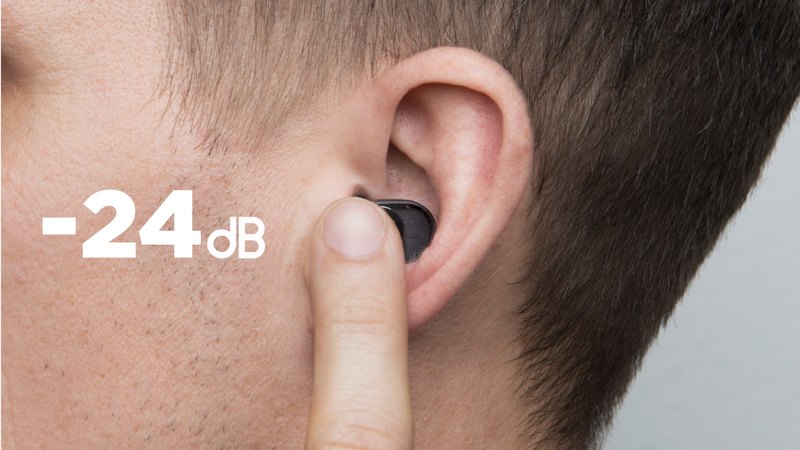 The music there is too loud for me – dbuds helps a lot! 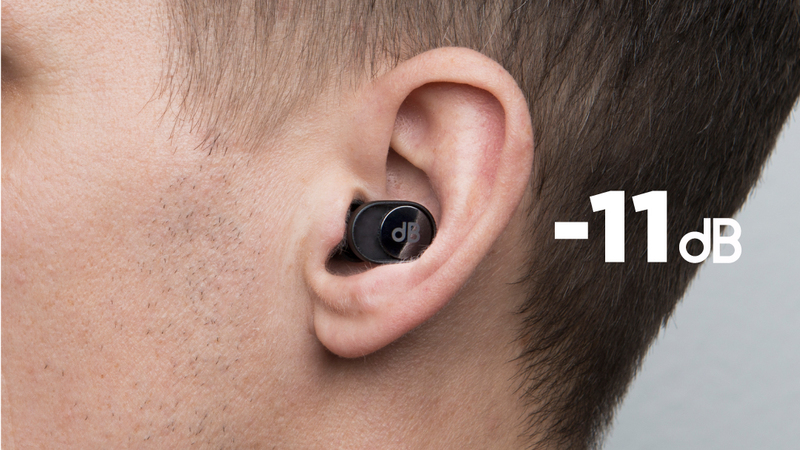 These are great for concerts and festivals – when the music plays, I switch to -30, and in between sets I go to -15 so I can talk to my friends without missing a beat. They’re also great for studying in cafes! I’m buying a few more pairs for myself, and to gift to friends. As a new born parent dBud save my ears everyday. I have been teaching drum kit and performing for over 20 years. I’ve used various earplugs over that time and the dBud is by far my choice of plug. Comfortable, clear sound and the magnets mean I don’t lose them like I use to. Having worked in Post Production Sound for all the major studios, I can say over the23 years I wish I had these back then as I probably wouldn’t be dealing with the Tinnitus I have now. I love these as having Tinnitus I’m able to wear them at loud events, or even noisy restaurants as it cuts the noise level down so that my Tinnitus doesn’t spike. I highly recommend these. Value for money, by far the best i’ve ever encountered. As a music producer, I find myself use them at recording studios, rehearsals and even just walking on a noisy street. highly recommended! anymore. My dBud “close” all the annoying noise around me: from the ventilation, the steps, the never ending loud conversation of your colleagues. It gives me peace of mind without to have to listen to music. Don´t missundertand me: I love music! But when I´m working I like it to be quiet. With the dBud you still hear what´s going on around you but it magically filters all that make you annoyed and unable to concentrate on your work. No batteries, no charging. I love it! I enjoyed them a lot during the concert. From now on always with me for events like that. It helped me with the crowd noise and screams of excitement. They fit well and I find hard to get the earplugs that would stay in my ears for long enough. these were great, I very recommend to everyone. I play bassoon in orchestras. Bassoons usually sit right in front of the trumpets, so I wear earplugs for rehearsals and concerts. I love that I can switch to the lower setting in rehearsals so I can still hear the conductor’s instructions without taking the plugs out, then putting them back in, then out, then in… Thanks, dBud! As frequent gigs and festivals goer, having good earplugs is a must for me. Too bad, I didn’t know this before surviving acoustic trauma with high sound sensitivity and tinnitus as a result. I tried conventional silicone party plugs, but the attenuation sometimes wasn’t enough and tinnitus got to the state, when I had to take a break from visiting loud places. This forced me to look for better protection, I was thinking about making custom plugs and then I randomly found your product and I have to say it was the best thing that could’ve happened to me. I use them on daily basis, using low attenuation walking down the noisy streets, using public transport, listening to music at home, and using high attenuation on the gigs and festivals. Since having them, I can enjoy parties much more without any consequences, tinnitus is almost non-existent and the same goes for high ear sensitivity. I recommend your product to everyone I know and to everyone with similar problems I had, it is a bargain for the price and real lifesaver. These earbuds are great for school, getting work done at coffee shops, and even in my own house. I am very sensitive to noises like chewing, yawning, etc., so these help me to stay calm and cancel out all of the extraneous noise that gives me anxiety. I am much more productive with these earbuds in and they help me to remain calm in social situations where, without them, I may snap at people. I’ve been playing live music for over 10 years. It was always a difficult decision choosing between regular earplugs, which mute frequencies unevenly, and playing with no protection. 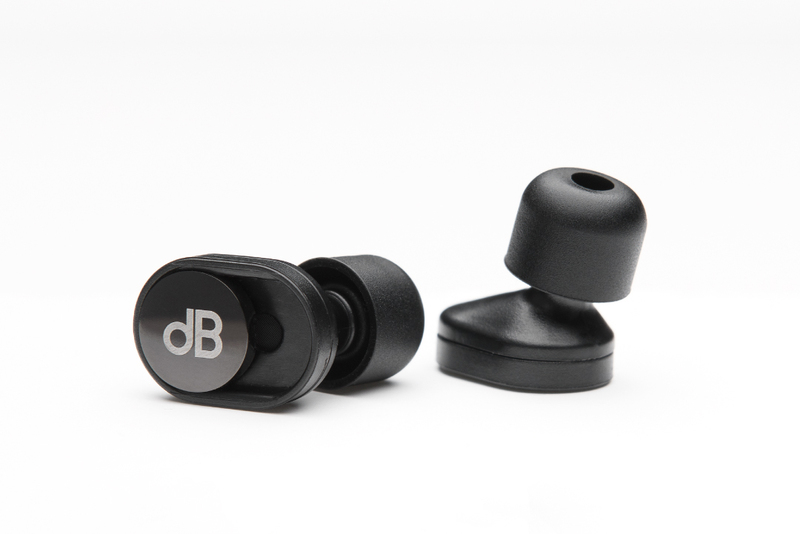 dBud is the best from both worlds, it protects your ears while staying true to the quality and mix of frequencies. Must have for musicians and concert goers!